Growth response to a single implant was measured in suckling steer and heifer calves grazing native range on three ranches in South Dakota, The steers (628 head) were randomly allotted on each ranch to either a Ralgro, Compudose, Synovex-C or no implant treatment. The heifers (714 head) were randomly allotted on each ranch to either a Ralgro, Synovex-C or no implant treatment. Implants were administered according to manufacturers' recommendations. The calves were weighed at the time of implanting and again 163 days later at weaning. The ears of steers receiving a Compudose implant were palpated at weaning to determine retention. The weight gain advantage of implanted steers over controls ranged from 4.5 t o 31.5 lb. Steers receiving either a Ralgro or Synovex-C implant gained more weight (P5.05) than controls (13.5 and 16.7 l b., respectively). Weight gains of steers implanted with Compudose did not differ (P>.05) from controls. The weighted average improvement of 12.2 lb. on implanted steers was worth $8.78. The weight gain advantage of implanted heifers over controls ranged from 8.3 t o 28.6 lb. Heifers receiving either a Ralgro or Synovex-C implant gained more weight (P,.05) than controls (18.5 and 20.6 lb., respectively). The weighted average improvement of 19.5 lb. on implanted heifers was worth $13.26. The retention rate of Compudose implants ranged from 79.1 t o 89.0%. with an overall average of 84.8%. In conclusion, all the implants appeared to give an anabolic response, with the Ralgro and Synwex-C responses being greater (P<.05) than controls. Differences between the weight gains of implant groups were not detectable (P>.05). Whittington, D.L., "Comparison of Ralgro, Compudose and Synovex-C Implants on the Growth Performance of Suckling Calves" (1986). 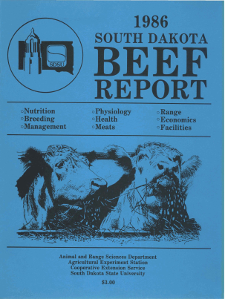 South Dakota Beef Report, 1986. 21.